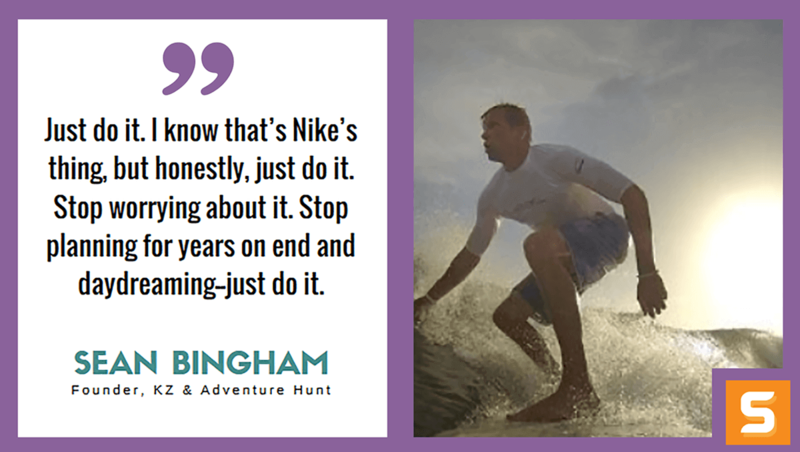 Sean Bingham is the founder of KZ, Adventure Hunt and TopBlip (now Gigg), a serial entrepreneur with a passion for adventure, sports, innovation, sales, marketing, networking and leadership. Sean started his career in sales and quickly became the no. 1 sales manager in the hyper-competitive home security industry. In less than 5 years, working just 4 months per year, he led a team to over $8M in revenue. In this interview, Sean shares his humble beginnings and how he quickly become the person he is today. He also shares how he started his first company together with his brother and how they both turned it into something bigger than they could have ever imagined. Discover Sean's mind-blowing entrepreneurial adventure in his interview below. After you are done absorbing Sean's insights, be sure to follow him on Twitter! What motivated you to start KZ, Adventure Hunt, and TopBlip (now Gigg)? Where did the ideas come from? My motivation for starting my own businesses is the strong desire and drive that I have to be the best I can be, make a real, impactful difference in the world, control my own destiny, have flexibility and freedom with my time, be my own boss and not have a ceiling on how much money I can make. I’ve always been very entrepreneurial. Even as a kid, I was self-motivated and enjoyed controlling my own destiny. I mowed lawns and even started a car detailing business. In college, I was a broadcast journalism major. I love sports and wanted to become a sportscaster (and still kind of do, I have a podcast--Simply The Best Sports Podcast on iTunes and SoundCloud). But even in college at BYU, I started my own show called Sports Valley and successfully pushed to get it aired on local cable. I later went into door-to-door sales because I kept hearing stories of young guys making 6-figures in a summer and knew that “if they can do it, so can I.” I did that for five years and was fortunate enough to be among the best--no. 1 Sales Manager in the entire industry one year even. KZ and Adventure Hunt are what I want to focus on, but I’ll quickly explain TopBlip (now Gigg). TopBlip was an idea that came about during a brainstorming session with my brother Justin. We were discussing what to do to replace door-to-door sales and he simply said “what if we did American Idol online?” That was all I needed to hear, we took off with it from there simply because it was a cool idea. We weren’t super involved with or even super passionate about music, but we were motivated to make it work and build something we could call our own. We grew it to the point of 300,000+ registered users, millions of pageviews monthly and regular contests involving artists like Andy Grammer, Parachute, Sara Bareilles, Maroon 5 and dozens more. We sold the company 2.5 years after launching it. Not a grand slam deal, but a fantastic and encouraging base hit for my first entrepreneurial at-bat. KZ was born shortly thereafter as Kameleonz. It was just a pair of sunglasses with interchangeable side arms. Really just a fun side project is all, but sales went really well our first three months, so I decided to take it more seriously and make it full time. Over the last three years since we launched, we’ve grown, improved and evolved quite a bit. 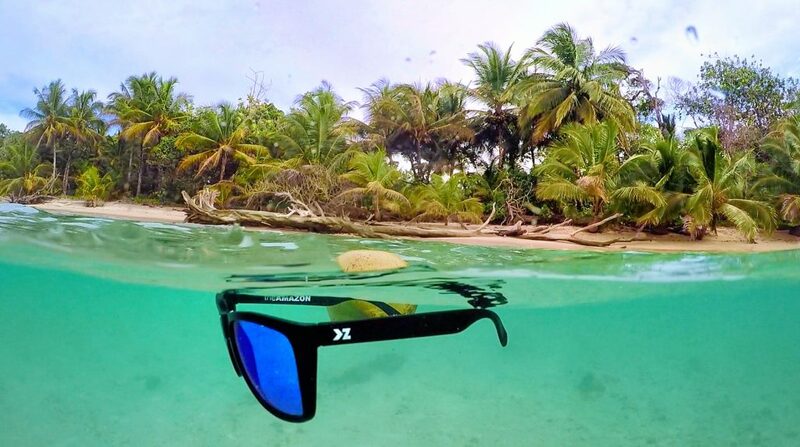 We expanded our sunglasses lines far beyond just interchangeable side arms, drastically improved design, packaging, quality, etc. We also added a variety of beanies and on Feb. 7 (about 6 months ago) we rebranded to KZ. So again, it started as a cool idea that just naturally expanded as I saw it’s potential. The coolest one in my opinion though is Adventure Hunt. Adventure Hunt was launched in May 2015 as a fun marketing event for KZ. I wanted to really do something cool and unique to build KZ and get people excited about the brand. KZ focuses on adventurous, outdoor living (one of my passions), so my brother Jared (another brother who works full time with me at both KZ and Adventure Hunt) and I began to brainstorm. There were a number of things that contributed to the idea, but in the end we came up with a real life treasure hunt where people would race in teams of two to complete a list of fun adventures in order to receive a clue to the location of buried treasure in their city. From there it was a race to solve the clue and find the treasure. The treasures were cool adventure gear from other companies I had created relationships with through the years doing tradeshows and networking with KZ. Companies like GoPro, Stance, Mission Belt, GoScope and of course, KZ. I flew around the country and literally buried treasure chests in 10 cities throughout the US. The grand prize was that one of the teams to dig up the treasure in their city would also win a free trip to Hawaii. The response was incredible. People loved it. We loved it. And KZ sales tripled immediately. I was in Huntington Beach for the Fourth of July last year while we ran an Adventure Hunt there and it dawned on me, this was bigger than we ever could have dreamed and bigger than we’d been giving it credit for. I called Jared right away and told him we were going to immediately launch more of these, but as a separate company with KZ as the lead sponsor. And we did just that. We took a few months after the first Hunts to build a website, sure up some solid sponsors, including Red Frog Beach Resort in Bocas del Toro, Panama, run some surveys from the first round of Hunts so we could improve and then we launched 15 more cities, which completed this last spring. We had over 26,000 posts on Instagram during our last Adventure Hunt and we were trending on Instagram every Saturday for five straight weeks while we ran the Hunts. The entire thing culminated with every single winning team from each city getting a free trip to Panama. We went down there just a few weeks ago all together and it was amazing!! Unbelievable experience that further inspired us to take Adventure Hunt to another level yet again. We’re now in the process of building out an app and incorporating other things that will make it bigger and better than ever. Look for announcements in the coming months. KZ and Adventure Hunt work great because they fit my passions and skill sets so well. I love to travel. I’ve been to over 30 countries. I’m always adventuring. I love to snowboard, surf, hike, rock climb, cliff jump, explore, etc. I’m also outgoing and social. And these are the things we brand KZ with and the things we get people to do in Adventure Hunt. Jared and I had also thrown massive parties back in my door-to-door sales days, which I forgot to mention, so we know how to get a group of people informed and excited about an event. We make a great team. As a serial entrepreneur, what’s your mission in the beginning of starting each business? My mission to begin with is to get the vision and the plan, but then go to work with clear goals and not let anything stop me from succeeding. The more important thing to do in starting a business is to take that leap of faith and act--so my mission in the beginning is to do just that. Once you do that, the rest tends to start to fall into place. Kind of what I just described above. I have a tenacity to never give up and a drive to be the best I can be. I have great partners and employees who help make things easy. And I’m a religious man, I believe in God and I believe He wants me to succeed and will help me succeed. I also believe in myself and in my partners, who for the most part, have been my brothers. We help each other and truly believe we can and will succeed, then we don’t stop until that happens. I think this goes right back to the first question you asked. My motivation and desire to be the best, control my own destiny, create something cool and impactful in the world, etc. My faith also keeps me going. Yes, they are. I believe in only hiring those who are self-motivated and passionate about what you’re doing. Employees who need lots of attention or hand-holding to get things done are much more of a liability than an asset. We’re very results driven at KZ and Adventure Hunt. Effort is nice and appreciated, but results are what we expect of each other--from the top down. What’s your secret for finding and ‘dominating’ a niche when starting a business? Finding something I like and feel I know, then making it unique in some way so it will stand out from the crowd. KZ and Adventure Hunt are trailblazers in cool, outside-the-box marketing too. We’ve done things on Instagram and Snapchat that yielded 12x returns because they were different. Then the copycats come along and saturate the market and we move to the next cool idea. Staying ahead of the curve and keeping up with trends is key. With TopBlip (Gigg), we had disappointed losing bands/musicians all the time. The overall response was very heavily positive, but you can’t please everyone when there’s a competition involved. We’ve had a few of those types of people with Adventure Hunt as well--upset that they lost. And with KZ, we’ve had a handful of people not happy about something also. In every case, the first step is to quickly and politely respond to the customer. Hear them out. We have all our rules, policies, etc. clearly posted on every website and we hide nothing. That helps a ton as you explain yourself (even though generally, you’re just helping console someone who tried hard, did well, but lost). We stick to company policies for the most part, but we’re smart enough to know that every situation is different, so we hear each person out and go from there. Is there a type of marketing that has worked amazingly for your companies? If so, how did you stumble upon it? Social media for sure is our main thing. We know it. We like it. We understand it. We get creative with it. And it works. If you follow us on Instagram, Facebook and Snapchat, you’ll see how we do things pretty quickly. Is there a resource (or resources) that helped you on your journey to starting really cool businesses? Google :) I would also highly recommend “How To Win Friends and Influence People”, great book. Just do it. I know that’s Nike’s thing, but honestly, just do it. Stop worrying about it. Stop planning for years on end and daydreaming--just do it. Go to work now and make it happen. What’s stopping you? Pick something you know well and have a natural passion for--you’ll have more fun and be more successful if you do. Only partner with and/or hire those you truly love, trust and need. Special thanks to everyone who has helped get KZ and Adventure Hunt to where they are today!